Mallow, planting and care of which is extremely simple, leaving for some time, our gardens under the pressure of new-fangled plants, recently back in the spotlight. Did not notice it on the site is simply not possible, she’s tall (80-250 cm), bright, blooming profusely (in some varieties the inflorescence is up to 150 flowers), with large (up to 15 cm in diameter) flowers, the most popular among gardeners semi-double and double varieties. Description of the flower has a variety of colors, from plain white, pink and red colors (the traditional colors) in a very popular purple / black (grade Nigra). We should note, sottogruppi Majorette Mixed – relatively low, up to 75 cm plants, semi-double with notched, similar to the carnation petals. But, sottogruppi Halo has a simple, dzvinochok flowers, but they are attracted to bright colors – in the center is a contrast stain that creates the light effect closer to the edges proceeds in a different color. Malva blooms very effectively. On the peduncle, the buds appear almost simultaneously, but flowering starts from the bottom and climbs up the inflorescence. So staci may, mallow can flower until the first frost. Mallow is good in the cut, it will look great in the bouquet. To do this, cut the plant at the stage of buds. Standing in the water, they bloom well and without losing appeal, can continue flowering for months. Famous mallow (other names – stock-rose mallow, cuddles) and their healing properties. Infusion helps to relieve inflammation of the stomach, and its use in gastrointestinal disorders. Tea from the flowers of the mallow are used as an expectorant and anti-inflammatory agent for coughs. When choosing a place for planting hollyhocks, you should remember that having very long and strong root system, it is very poorly tolerate transplanting. So in one place mallow can grow quite long. For planting suitable well lit area, with fertile and loose soil, well drained and rich in humus. For many years growing is to plant mallow in the lowlands during the spring thaw there will be water to stagnate, leading to root rot. Optimal soil for mallow – light loam. Avoid places with drafts – in a strong wind, despite the strong stalk, a tall plant may just break. Tip! A good solution would be planting hollyhocks along the fence – it can act as a support, it will be possible to tie the stems. 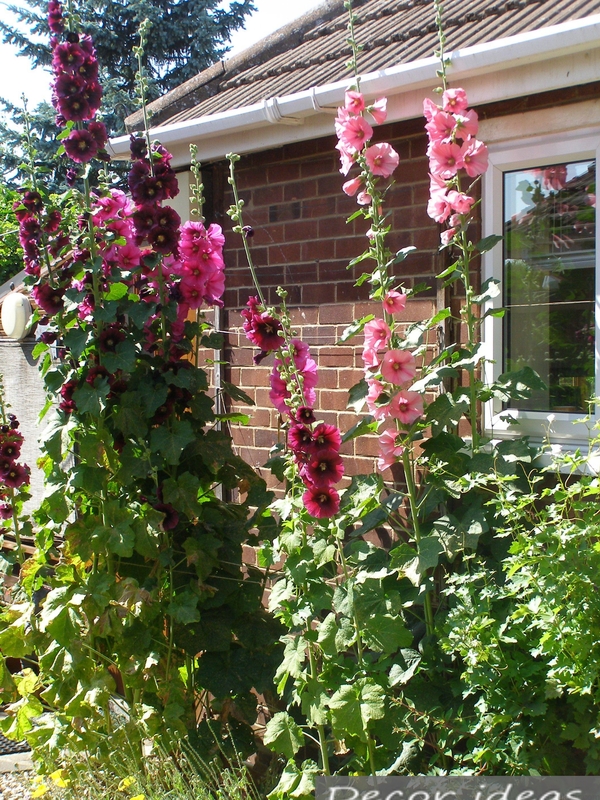 Planting perennial hollyhocks is done in a group or rows, not a lot, spacing between plants of about half a meter. The mallow can be attributed to the plants the type of “Put and forget”, care mainly consists in loosening the soil of the soil to provide additional aeration. Hold it carefully and not very deep, so as not to damage the roots. To give the plant more attractive, remove faded and dead flowers.